About a year ago I was lacking inspiration for what I could bake one week. For some reason I decided to ask Jamie for ideas. 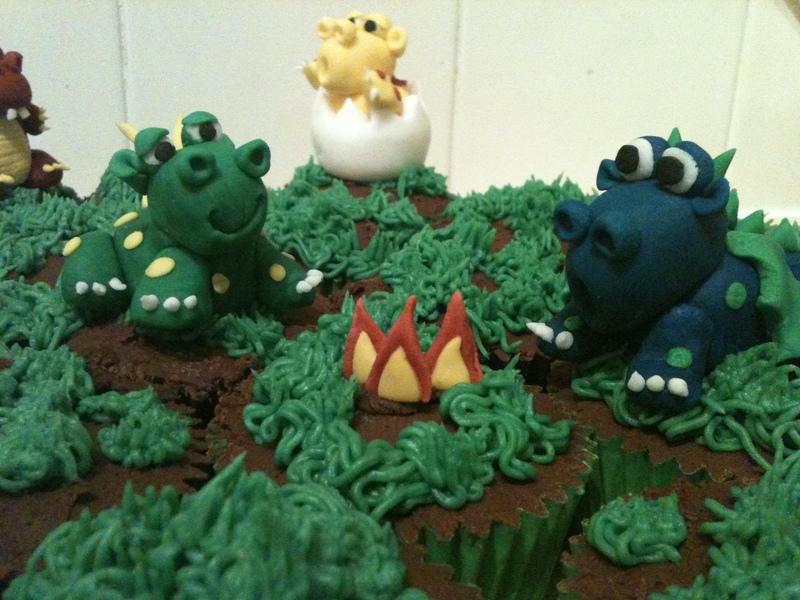 He said I should make “a giant popping candy cake with a dragon on top”. I laughed and said I wanted serious suggestions! But then when I got home, and I realised I didn’t have anything else to do that evening, I thought why not try making a dragon out of icing. After I’d made one I decided it was quite cute so had a go at making another…. and after a couple of nights I had a small family of dragons! In total I made 6 dragons and then it was time to make a home for them. 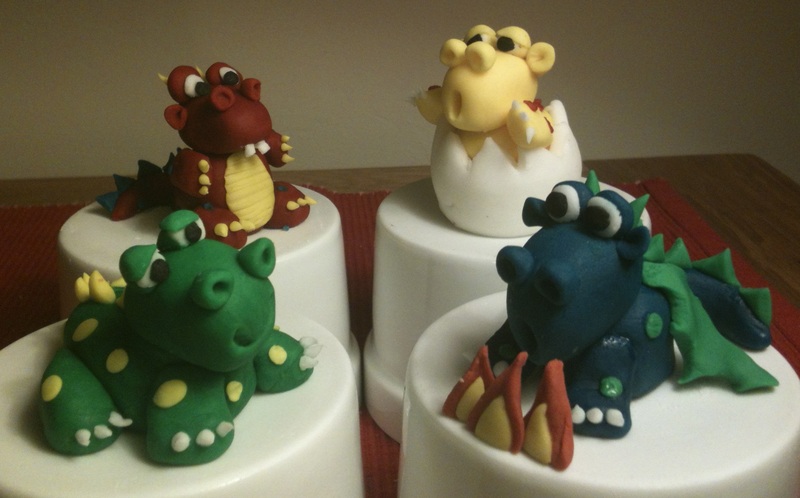 I wasn’t going to go as far as the giant popping candy cake but I thought the little family of dragons could be arranged on cupcakes to create a scene. 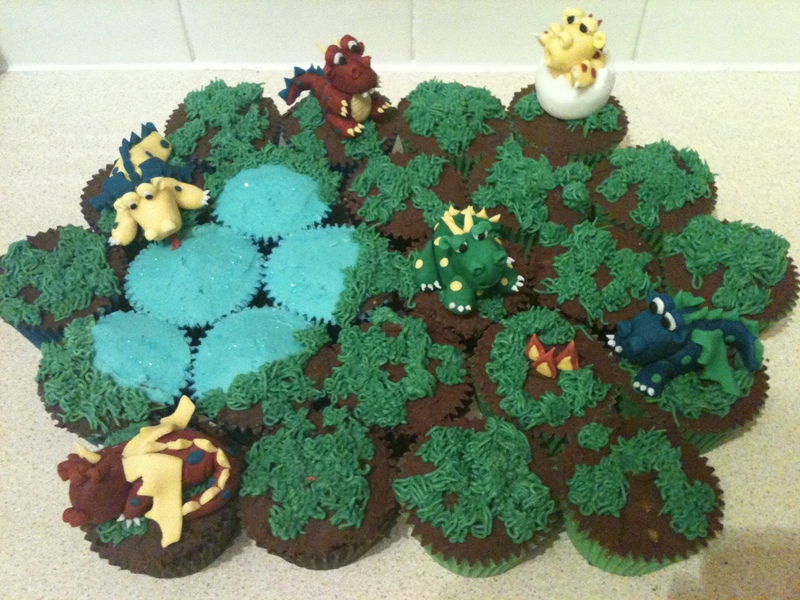 So I made a selection of chocolate, caramel and vanilla cupcakes (in different coloured cases so that people knew which flavour they were going to eat) and then spread them with “mud” (chocolate buttercream) or “water” (caramel buttercream coloured blue finished off with a sprinkle of glitter) and finished them off by piping some tufts of “grass” (vanilla buttercream coloured green). I started by taking a chunk of icing and shaping it to form the main body and tail. 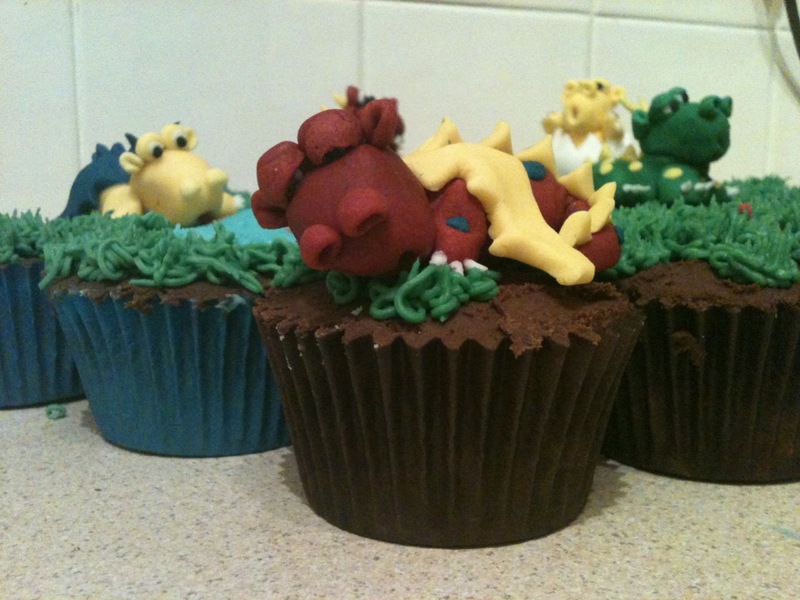 The legs and head were then made out of the same coloured icing and stuck on with a bit of water. I used the end of a paintbrush to make the mouth. The nostrils were made using two small balls of icing which I pushed onto the end of the paintbrush to create the holes – they were then stuck onto the head with a drop of water. The eyes were made in a similar way to the nostrils but then a ball of white icing, with a tiny dot of black, was put into the middle of each. The ears were made by taking a tiny ball of icing, flattening it to form a circle and then it was rolled slightly and stuck onto the head. The claws were made out of tiny pieces of white fondant icing, stuck onto the ends of the arms and legs with water. I then rolled some of a different colour out on the work surface with a bit of icing sugar to stop it sticking and cut out lots of small triangle for the spines down the back, and some wings – all stuck onto the body with a bit of water. Finally I rolled out some tiny balls of icing, a different colour to the body, squashed them and then stuck them onto the body as spots. I tried to make each dragon different but followed the same basic steps for each one – I just adjusted the shape and colour of the body and made them have different facial expressions.